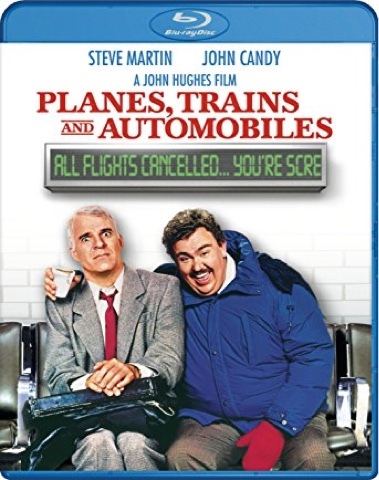 John Hughes’ Planes,Trains and Automobiles is arguably the best of his adult comedies that he wrote and directed following Ferris Bueller’s Day Off and it features cameos from several alumni stars of previous Hughes films, such as Ben Stein, Edie McClurg, Kevin Bacon, William Windom, Lyman Ward as well as character appearances by Bill Erwin, Richard Herd, Martin Ferraro, Larry Hankin, Dylan Baker and Michael McKean. It was also the first comedy he directed that was not centralized around high school characters. What made John Hughes’ comedies so much fun is he had a magical ability to feel the pulse of the 1980s and understood teenagers in a way that it spoke directly to them instead of exploiting them or talking down to them and the same can be said of his adult comedies, which tended to feature upper middle class to all out well off Parents and Adults wanting things that were relatable for almost anyone regardless of where you were from. So whether it is a young man struggling to write his first novel while working full time writing matchbook cover ads and trying to provide a better life for his wife and there soon to be born first child, an unorthodox Uncle baby sitting his brother’s children or simply the tale of a man (Steve Martin) trying to get back to his family in time for Thanksgiving and encountering all sorts of hilarious setbacks along with well meaning, but somewhat obnoxious shower curtain ring salesman (John Candy), in one of his best big screen comedic roles. Through unlikely circumstances or perhaps fate, both men manage to grow beyond their perceptions of each other leading to a heartwarming conclusion that captures the true meaning of Thanksgiving, which is my favorite holiday of the year. Presented in a beautiful high definition 1080p transfer I don’t think Trains, Planes and Automobiles has ever looked better. A full English DTS HD MA 5.1 Surround Soundtrack mix is included along with Spanish and Portuguese Language Mono Dolby Digital Soundtracks as well as English Subtitles for the Deaf and Hearing Impaired and English, French, Spanish and Portuguese Language Subtitles encoded as options. There is also a companion standard definition DVD included with a 16 by 9 enhanced presentation as well as English Dolby Digital 5.1 Surround Sound and Spanish Language Mono Dolby Digital Sound too. English Closed Captions for the Deaf and Hearing Impaired and English, French and Spanish Language Subtitles are also included on the DVD. Exclusive to the Blu-ray Disc are John Hughes: Life Moves Pretty Fast, which is split up between two HD featurettes, which are The Legacy Of John Hughes (27:39) with new interviews with Producer Howard Deutch, Actors Mathew Broderick, Alan Ruck and John Cryer as well as Actress Leah Thompson. Heartbreak and Triumph (25:32) details John Hughes career from Advertising to writing for National Lampoon and then his work as a screenwriter on National Lampoon’s Vacation and Mr. Mom and then his career as a Writer and Director as well as the voice for my generation that began in films like Sixteen Candles and The Breakfast Club and continued onward from there with Weird Science and Ferris Bueller’s Day Off and beyond. A humorous deleted scene entitled Airline Food (3:24) is also included in full HD. Retrospective featurettes covering the making of Trains, Planes and Automobiles (16:38) and a press junket with John Hughes (4:02) and Steve Martin highlighting the comedy of John Candy (3:01) wrap up the extra value features found within the Two-Disc Set. A coupon containing a limited time only redeemable code for either an iTunes Digital Copy or an Ultraviolet Digital Copy is included within blue BD case too. Planes, Trains and Automobiles: Blu-ray + DVD + Digital HD Copy 30th Anniversary Two-Disc Set is available now at retailers on and offline courtesy of Paramount Home Entertainment.